One of the things we love about living in Marikina is that we have almost everything we need within the city. After Berto’s trip to Majayjay Laguna, he has been complaining of aching muscles, so I decided to treat him to a relaxing massage at our favorite spa in Marikina, The Marikina Garden Spa located along Gen Ordonez St. Marikina Heights Marikina City. Before going there, we called ahead to make sure that the couple’s room, The Butterfly Room, is available. Aside from the privacy it provides, we also like that the room has its own shower so we can freshen up before our massage. Soap, shampoo, conditioner, towels and robes are provided. There is also hot water, which is a big plus! The butterfly room air-conditioned and has two clean massage beds. Linens smell so good! It is decorated with simple lamps and butterflies. The intensity of the room light can be adjusted to one’s liking. While inside, relaxing ambient sounds are played to help you relax, even fall asleep, in fact they let you sleep for a bit after your massage, which is perfect! An hour long massage costs only P350 but if you request for the couple’s room that will cost extra (P50). Additional charges also apply if you want to use the shower (P50). 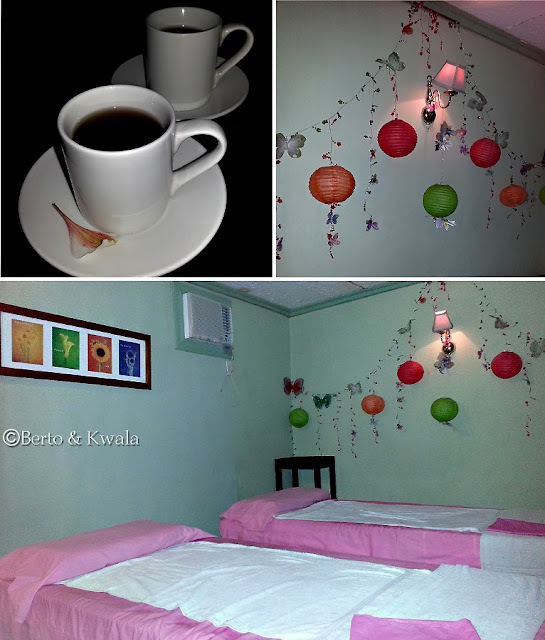 We paid P900 for our massages, inclusive of the charges for the room and shower. We love that the staff in the Marikina Garden Spa is all friendly and courteous. They almost always answer the phone on the second ring. We got there a bit earlier than our schedule so they let us sit on the relaxing chairs and served us hot tea. We are not newbies in the spa scene. We love getting massages. What we do like in Marikina Garden Spa is their unique and consistent style. Sure there are masseurs we prefer and request for, but their styles are basically the same. They kneed through our knotted muscles expertly and adjust the massage strength depending on your preference. Aside from their different massages, they do offer other services like body treatments (scrubs), body treats (eyelash perming, ear candling, underarm bleaching etc. ), special facials and waxing. To complete the whole pampering experience, they also offer manicure/pedicure, hand and foot spa and other pampering packages. They also offer special Dermatological Treatments (peeling, Botox, anti-cellulite, whitening) and Slimming Programs. Don’t worry, they are supervised by a certified Dermatologist (MD). Walk in clients are welcome, but if there are specific massage therapists you’d want to request or if you want to book the butterfly room, call ahead just to be sure. By the way, they also have a cool events place called La Veranda where one can have their wedding receptions and birthday parties. Visit their website for more info. If you request the Butterfly room, you not only pay the extra 50/PAX for the couple's room, but you're also charged 50PAX just because there's a shower in the room, even if you do not use it. We were just there last night, in this room. Also, the very small bathroom does not even have an enclosure for the shower. I wish I took a pic! You open the door and you shower right there, the toilet bowl is further in. It was also not clean. No toiletries available either, nor were there robes. Maybe this place is not as good as when you were there last. We also were not offered anything to drink. When paying out front, I mentioned this to Inday, the receptionist and she asked a staff to get us tea. I asked for water instead, should've just had tea because the water was warm. Hubby and I only took a sip, we grabbed a drink on our way home.